John Prine's debut album was released almost 40 years ago and with his latest offering, In Person And On Stage, he refuses to show any signs of hanging it up. As the title suggests, this is a live compilation album showcasing John's songs and stories in front of a few different engaged and enthusiastic crowds. John is solidly backed up by a two piece band that would make Johnny Cash proud consisting of Jason Wilbur on lead guitar and mandolin and Dave Jacques on stand up bass. On a few of the songs, John is joined by some amazing guest; Emmylou Harris, Sara Watkins, Iris Dement and Josh Ritter. All of these ingredients combine together beautifully for an intimate and fun record of live songs. In Person And On Stage turns out to be a nice retrospective of John's catalog as he does a great job of picking songs from throughout his long and storied career. He evens brings out 4 songs from his 1971 debut album John Prine. One of John's most well known songs, "Spanish Pipedream," opens the album to a spirited crowd who only stop cheering long enough for him to get the words out. Clearly they are enjoying themselves and their response immediately draws you in to the show. John is infamous for his story songs and we are lucky enough to get some of his finer examples in "The Bottomless Lake" and "You're Flag Decal Won't Get You Into Heaven Anymore" complete with story introductions. John's sense of humor and wit really shine through in his lyrics and stage banter, especially in these two songs. Whether stomping through A.P Carter's "Bear Creek Blues" or providing a subdued backdrop for John's own "Long Monday," Jason and Dave tastefully create beautiful spaces for the songs to exist in. 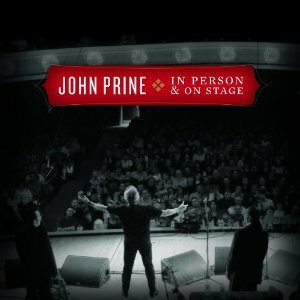 John Prine will always be worth the price of admission on his own, but the duets capture some special moments that really make the album a must have. Emmylou Harris joins John for an ethereal version of "Angel From Montgomery." Sara Watkins lends her voice and a weeping violin solo to "The Late John Garfield Blues" that makes the song even more heartbreaking. Iris Dement duets on "Unwed Fathers" and the hilarious "In Spite Of Ourselves" to stunning and entertaining results. Josh Ritter does his best to match John's delivery of "Mexican Home" and really brings a level of respect and presence to the performance. John's first album came out 5 years before Josh was even born, so it's nice to see two singer/songwriters from different eras share the same stage and sing together like they've been doing it for years. Some may see it as an aural passing of the torch, but as John shows in every heart felt performance on In Person And On Stage, I really don't think he's going to be ready to hand it over any time soon. In Person And On Stage will be released this Tuesday, May 25th on Oh Boy Records.